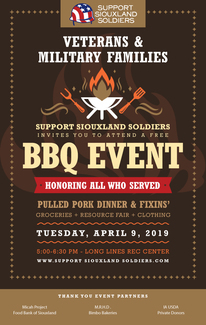 Thank you for helping us provide an evening of support and camaraderie for our Siouxland Veterans and their families on Tuesday, April 9, 2019 at the Long Lines Rec Center, 401 Gordon Dr. The event will include dinner, groceries, clothing and a resource fair. Please choose a task below and if you're able to bring a dessert to share, that would be great too! Thank you for helping us serve our Siouxland Heroes! SCROLL DOWN and select the time slot and task you would like to volunteer for below. 1. Please arrive 10 minutes prior to your shift. 2. Upon arrival please check-in at the front desk. 7. Thanks again and we hope you have a great time and make many new friends! Location: Long Lines Rec Center, Hall of Fame, 401 Gordon Dr.
Drop off your pie between 3:30 - 5:00 p.m.
I’ll donate two pans of banana pudding with Nilla wafers. Will drop off money, you can get the right ones. Nurses or nursing students to provide free blood pressure checks, please bring a stethoscope.